I'm sure a lot of people think that I'm full of it when I say my daughter eats greens. 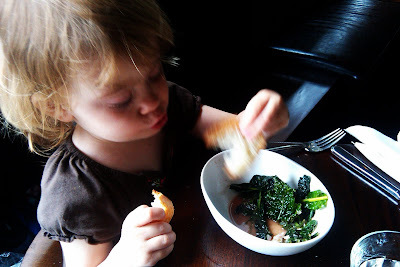 They can't seem to imagine that a two-year old would enjoy sauteed kale, or chard. Well, here you go! We had dinner at Lecosho last week. Their happy hour has things like sausage and lentils, rillettes, and sauteed greens. Lorelei was lapping up the jus from the bottom of the bowl and gladly took little fork fulls of the stuff. This goes to show ya that if you feed your kids food, they'll eat it. If you're introducing something new, be sure to have something familiar along side of it, that way you can alternate the two giving you a greater chance to get at least three bites into your monkey. Why three bites? The first bite they are skeptical. The second bite they're wondering why you're feeding them this stuff. Third bite, they decide whether they like it or not.